Traumatic brain injury (TBI) is a serious public health problem in the United States. Each year, traumatic brain injuries contribute to a substantial number of deaths and cases of permanent disability. Recent data shows that, on average, approximately 1.7 million people sustain a traumatic brain injury annually. CDC’s research and programs work to prevent TBI and help people better recognize, respond, and recover if a TBI occurs. A concussion is a type of traumatic brain injury that changes the way the brain normally works. A concussion is caused by bump, blow, or jolt to the head or body that causes the head and brain to move rapidly back and forth. Even a “ding,” “getting your bell rung,” or what seems to be a mild bump or blow to the head can be serious. • Most concussions occur without loss of consciousness. • Athletes who have, at any point in their lives, had a concussion have an increased risk for another concussion. 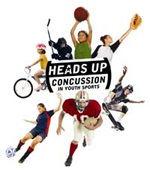 • Young children and teens are more likely to get a concussion and take longer to recover than adults. Rest is key to helping an athlete recover from a concussion. Exercising or activities that involve a lot of concentration, such as studying, working on the computer, or playing video games, may cause concussion symptoms to reappear or get worse. After a concussion, returning to sports and school is a gradual process that should be carefully managed and monitored by a health care professional. Concussions affect people differently. While most athletes with a concussion recover quickly and fully, some will have symptoms that last for days, or even weeks. A more seri-ous concussion can last for months or longer.